Picking the right chart for your data can be tough. Should it be a pie chart? A column chart? Or a bar chart? Let Excel do the hard work for you. Excel's Recommended Chart feature will recommend the best charts for your data. 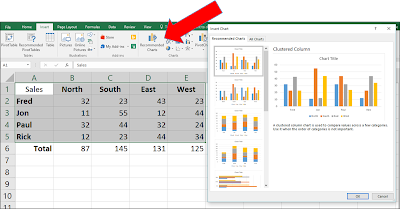 It's easy to let Excel show you the best charts for your data. 1. Select a cell in the range of data you want to see as a chart. 2. On the ribbon bar, select The "Insert Tab".